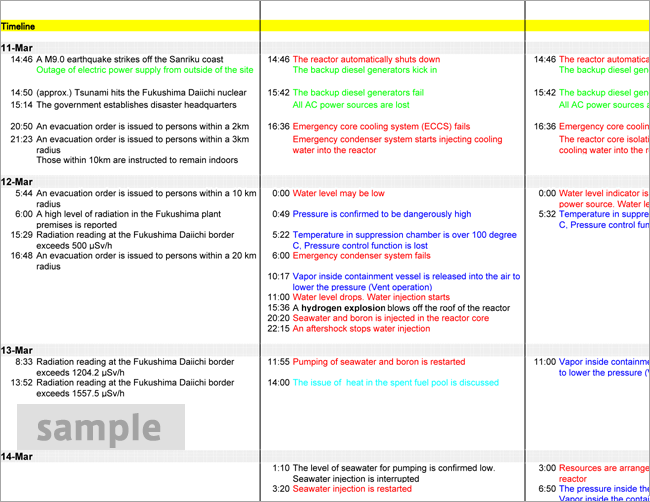 The Timeline of the Fukushima Daiichi covers the nuclear accident and the government and corporate responses from March 11 to April 30. We believe that the timeline has provided the public with information to better understand the current situations of each plant unit. Together with the TEPCO’s “Roadmap towards Restoration from the Accident at the Fukushima Daiichi Nuclear Power Station” announced on April 17, we think that the timeline is and will be of use to those who aim to understand the past, the present, and the future of the nuclear accident. The sources of the information are Prime Minister of Japan and His Cabinet, TEPCO Press release, METI Press release, and METI The Nuclear and Industrial Safety Agency. Inconsistency may arise due to different time stamp given from different agency on an event. Events on pressure vessels are written in red, those on containment vessels and suppression chambers are in blue, those on power supply are in green, those on water pool and radioactive contaminated water are in pink, and those on spent fuel pools are in light blue. As of May 1 the situation remains very serious however. For those who are looking for further status updates, we recommend those provided by IAEA(International Atomic Energy Agency) or by the New York Times.